According to a study published in the Archives of Gynecology and Obstetrics, women who exercise regularly protect bone mass during pregnancy by doing so. 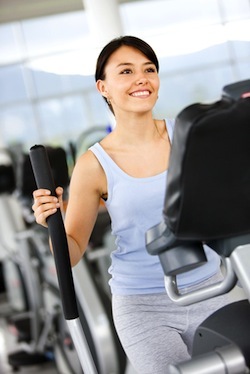 Researchers studied women who exercised regularly and those who did not. The bone mineral density was measured in both groups between 14 and 20 weeks and again between 36 and 38 weeks. All physically active women in the study completed a minimum of 10 hours of exercise per week with the median exercise time measured at 13.1 hours per week. The non-exercising group of women was low-risk so no other factors were present that could contribute to bone mineral density loss. The physically active group of pregnant women consisted of 24 participants. The non-physical group consisted of 94 pregnant women. At the end of each pregnancy, bone mineral density (BMD) was measured. Women in the physically active group lost, on average, 0.015 g/cm². Women who were not physically active during pregnancy lost, on average, 0.041 g/cm². Bone loss occurs naturally in women as they age. When women hit menopause, bone loss speeds up as estrogen and progesterone stop being produced as pre-menopause rates. Women in menopause are told to exercise regularly to maintain bone mass and potentially increase bone mass over time. It appears, according to this study, that pregnant women should follow the same suggestions. Depending on a pregnant woman’s health, physical activity limitations may differ so always speak with your obstetrician before starting a new exercise program during pregnancy. Weight bearing exercises are commonly used to prevent bone loss, but not all weight bearing exercises are safe during pregnancy. Source: William W.K. To and Margaret W.N. Wong. Archives of Gynecology and Obstetrics. 9 April, 2012.